Three months in, Rural Action's new watershed based Americorps are well on their way to a outstanding year of service and are really getting their hands dirty (and wet) in their new roles improving our water and reaching out to local communities. In a new recurring feature for the Rural Rambler, we would like to share with you some of the exciting, moving, and occasionally thrilling (hopefully not too many of that last one, thrills can be scary) stories coming in from our watershed volunteers. Today we share an inspirational story from Amy Kettner, from the Moxahala Watershed as she recounts a recent afternoon with some local kids. 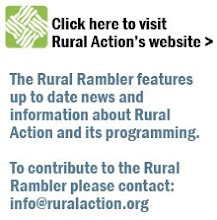 Keep your eyes peeled for Americorps in action in your neighborhood and keep reading the Rambler for the latest dispatch - Reporting from the Field!